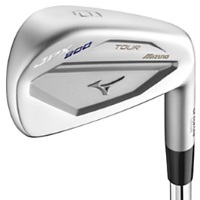 The JPX 900 Tour combines the best attributes of Mizuno's Grain Flow Forged Player's irons, with the advanced weighting strategies, and aggressive styling of their JPX series, providing a compact, workable iron with a surprising level of playability. Large camber with rounded leading and trailing edges ensure consistent turf interaction. Thinnest sole ever created on a JPX golf club for maximum versatility and playability. Reinforced top line ensures a strong, powerful sound at impact.